The Maine lobster harvest for the year nears its peak in October, according to Gov. LePage. And since Maine is the home of the American lobster, the governor said it is time to celebrate. And not just celebrate the joys of lobster to the palate, but the pride for the Maine lobster fishermen as well. There are 4,260 licensed Maine lobster fisherman. In 2010 they caught a record 93 million pounds of lobster worth more than $310 million. This year officials are hoping for another record harvest. Gov. LePage said Maine’s picturesque harbors capture a special quality as lobster boats come and go in the pristine, natural environment. The state leads in lobster fishery conservation and sustainability practices. The Maine lobster fishery is one of the oldest and most important segments of the Maine economy. A Steuben, Me. lobster boat leaves the dock. While the harvest may reach its peak in October, live lobster are available year round. During the winter the catch is stockpiled in large, natural salt water lobster pounds. This is why lobster lovers can enjoy baking and steaming live lobster year round. 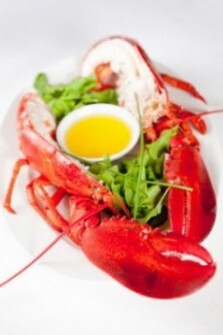 Many thousands of people enjoy lobster all during the holiday season and when winter snow is on the ground. But for now, folks lucky enough to visit Maine in October can enjoy both Mother Nature’s magnificent fall foliage and a fresh caught lobster dinner. Portland, Me. is hosting a food and wine fest, Harvest on the Harbor Oct. 20-22, 2011. If you can’t get to Maine, fresh Maine lobster can be ordered online in the winter, spring, summer and fall and shipped overnight anywhere in the country. Celebrate Maine Lobster Month. The Machias Bay area — Machias and Machiasport Maine– had a rough beginning, even by Maine standards. The settlers saw buildings sacked three times during its early history. Once by the French trying to kick the English out of Northern Maine, and later by the British during the Revolutionary War, and again during the War of 1812. The Lobsters-Online.com web site features great information about lobster along with information on how to steam lobster and steamer clams.